Fire and Smoke Solutions have extensive experience covering a selection of sectors and environments including Residential, Carpark, Shopping centre, Hotel, Theme Park, Commercial & Education. The below reference list states key details of projects we have been involved in on behalf of our clients with the specific services provided by FASS. Design advise, study & review through to supply, install, test and commission. Mechanical Salter Street Refurbishment Design, supply, installation and commissioning of 5 level residential smoke ventilation system including car park smoke ventilation. Mechanical 5 Bath Road Refurbishment Test Car Park system and report. Mechanical Kingsway Hove New Build Design, supply, installation and commissioning of smoke ventilation system for 4 levels and car park. Pressurisation Thrale House Refurbishment Design, supply, installation and commissioning of pressurisation system in 6 floor single stair office. Natural HMP Stocken New Build Design, supply, installation and commissioning of pressurisation system in 6 floor single stair office. Atria University of Essex Refurbishment Design review and calculations for atrium smoke ventilation system. Industrial / Warehousing Military Workshop New Build CFD study of ventilation system. Industrial / Warehousing Military Stores New Build Commissioning of natural smoke ventilation. Mechanical Citizen M New Build Design, supply, installation and commissioning of 10 level system. Mechanical Belfast City Quays New Build Design & Supply of mechanical extract system with natural inlet over 8 levels. 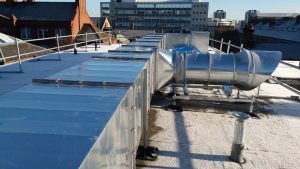 Pressurisation 118 Warwick Road Refurbishment Design, supply, installation and commissioning of pressurisation system covering 2 cores each of 12 levels including fans, attenuators ductwork dampers and controls. Mechanical Pure Gym Shoreditch New Build Design, supply, installation & commissioning of Basement smoke ventilation. Mechanical East India Dock Pure Gym Refurbishment Design, supply, installation & commissioning of Basement smoke ventilation. Leisure Legoland New Build CFD analysis of smoke ventilation of theme park attraction. Mechanical Grafton Quarter New Build Design, supply, installation and commissioning comfort ventilation. CFD analysis of smoke ventilation. Natural 116 College Road Refurbishment Design, supply, installation and commissioning of 4 level residential system. Residential Rickmansworth Road Refurbishment CFD analysis of extended corridor smoke ventilation system. Mechanical 5 Bath Road Refurbishment Design and CFD analysis of smoke ventilation system. Commissioning support. Mechanical Bradfield Close Refurbishment Design, supply, installation and commissioning 2 level residential. Mechanical 8 Bath Road Refurbishment Design, supply, installation and commissioning of 5 level residential system. Natural Tariro House Refurbishment Design, supply, installation and commissioning of natural smoke ventilation system over 3 level. Design The Mill House Refurbishment Design review of installed provisions. Residential High Street Watford New Build CFD analysis of as built smoke ventilation system. Design Oceana Boulevard Refurbishment Design, supply, installation and commissioning of mechanical smoke extract system over 7 levels. Mechanical Rowlands House Refurbishment Design, supply, installation and commissioning of mechanical smoke extract system over 7 levels. Natural Chocolate Box New Build Design, supply, installation and commissioning of natural smoke ventilation system in mixed use building. Residential Newton Leys New Build Design, CFD modelling, supply, installation and commissioning smoke ventilation and comfort ventilation. Residential Shoreditch Village New Build Design, supply, installation and commissioning of mechanical smoke extract system over 7 levels. Residential Gloucester Avenue Refurbishment CFD analysis of extended corridor system. Assisted living Tembani Court Refurbishment Design review of existing provisions & development of appropriate design for extended corridor smoke ventilation system covering 4 level residential system. Student Accommodation Beckley Point Refurbishment CFD analysis of smoke ventilation system. Commissioning support. Retail Kings Mall Hammersmith Refurbishment Design, supply, installation & commissioning of Basement smoke ventilation. Retail Lidl Loading Bay New Build Design and supply smoke ventilation system to loading bay and under croft car park. Retail Castle Point Shopping Centre Refurbishment Design review and calculations for natural mall smoke ventilation system upgrade.